Lisez cet examen en français ici. I wear glasses and there is no problem with my frames. However, you should try on different glasses to see how they fit, especially if you like thick frames. With the Harmony processor, you set the volume knob to 12:00 before putting it on. But something as simple as running your hand through your hair to put it behind your ear may change the volume accidentally. This can be unpleasant if it becomes too loud or too soft. So we must constantly monitor if the volume is at the nominal setting (ideal for good hearing). For me, of course I prefer the digital volume control that the Naída Cl Q70 offers. You press a button to change the volume so accidental gestures are no longer a problem. When you put on the processor, it is on the nominal volume and ready to go. I never need to increase or decrease the volume. On the Harmony, there is a choice of three programs. A small lever, of the type found on old conventional hearing aids, is used to select the program. Obviously, this is another vote for Naída Cl Q70 because there is a choice of five programs (a lot!) that can be selected by pressing a small button. With each program change, beeps let you know which program is selected, so you cannot choose the wrong one by mistake. When you put on the processor, there is also a beep indicates you are on the main program setting. This means that you are on the program 1 and the volume is at the nominal value. You don’t have to remove the unit to verify any situation, there is a beep for each step …. This is great! In fact, words fail me. In my case, I have two sizes of battery, the large and the small. As with Harmony, I prefer the larger battery because of its longer life. With the small battery, it seems like I would have to change it too often. So when I have to buy new ones, it is obvious that I will opt for the larger battery. The battery life may vary with your programs, it all depends. There are programs that can be more economical but I prefer to choose the best program according to my needs and according to the situation. With my programs, the large battery lasts 20-24 hours, and the small battery lasts 8-12 hours. On the Harmony, you slide the battery forward to remove it. So you have to be careful and proceed slowly to avoid damaging the T-mic. With the Naída, you rotate the headpiece cable up and then slide the battery back, away from the T-Mic, so there is no risk of damage. On the Harmony processor, the battery slides easily from the processor. But with Naída, the battery clicks into place and stays there. In my opinion, the researchers listened to the users well. They added a small metal piece to the new batteries that locks with a metal piece on the processor and also on the charger. So the batteries always remain firmly in place. However, if you want to change the battery while keeping the processor on your ear, it takes more manual skill than with the Harmony. Only one of my Harmony batteries had broken plastic tabs. On the Naída, two small guides are not visible because they are covered. I think the batteries slide very well. The locking mechanism is a little different. Given the short time that I have had the Naída, I cannot confirm the performance of the tabs or their fragility. As with the Harmony, the LED on top of the processor indicates the battery status. 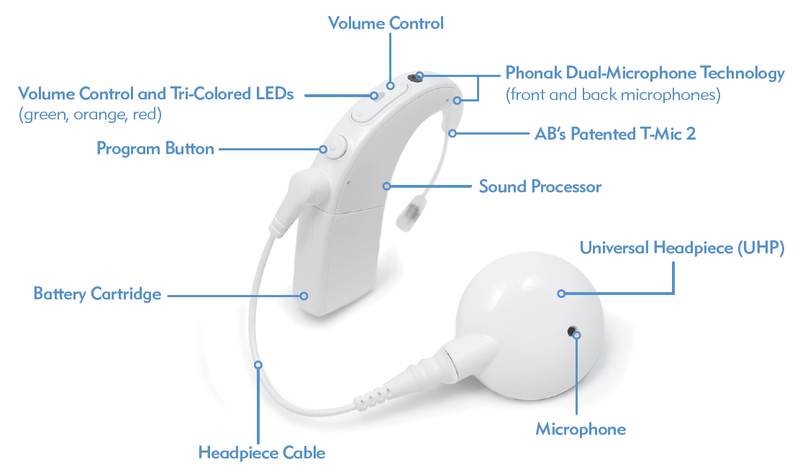 On the Naída, the audiologist can enable an LED on the processor for children. This is to inform parents or caregivers that the implant is working properly. When you are wearing the Naída, there is a new beep to warn you about battery life that starts about an hour before the battery is completely discharged. The charger is cute! It is smaller than the Harmony charger, and you can charge four batteries at a time. A green LED indicates that there is power. There are four LEDs for the batteries. When a battery is charging, a small blue light is on. The light turns green when the battery is charged. There are two ways to power the charger. You can plug it into a wall outlet. There is also a USB cable that allows you to leave the power adapter at home. 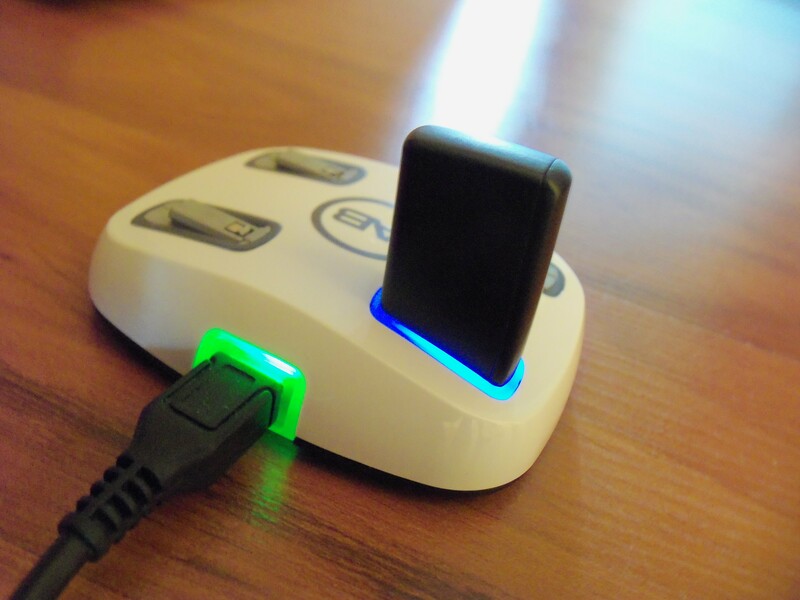 You can connect the charger to your computer, or use the charger cable from some cell phones. Sometimes the Harmony T-Mic rotates away from the ear, so you may not hear as well, and the processor may come off more easily. With Naída, this is all in the past. It’s awesome! The elbow of the T-Mic 2 is fixed and held in place by a mini metal pin that goes through the processor, so the T-Mic cannot rotate at all. This also helps keep the processor in place. The tip of the T-Mic is an intra-auricular microphone intended for noisy environments. It has some flexibility but stays in place anyway. 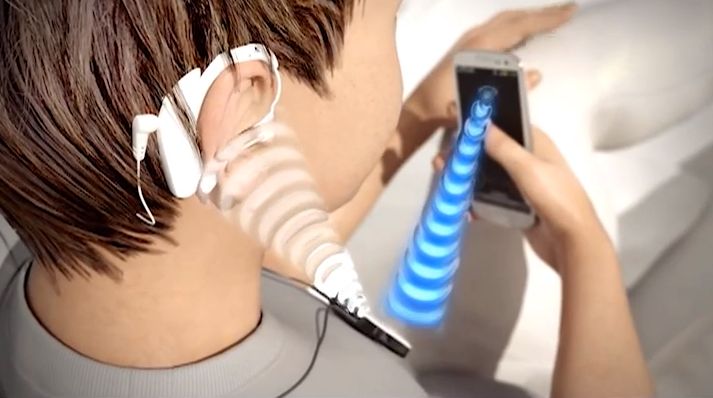 The mike is positioned slightly inside the entrance of the ear canal, so there is no obstacle when using the phone. You do not feel its presence. This is perfect for a cell phone or other listening devices. It is a unique feature, and very discrete. It is transparent, and people generally don’t notice it. One thing I’m not sure I love is the cover (the small plastic part) that covers the end of the T-Mic 2. This part should be replaced about every 3-4 months or as needed to maintain sound quality. I tried to remove it with the audiologist, but it is difficult because it is very tiny. There is probably a trick or solution to remove it without too much difficulty. Naída has four microphones. Each microphone is activated depending on the program. There are two on the top of the processor, one on the headpiece, and the T-Mic itself. With these extra microphones on the Naída, you can hear more sounds. This is another adaptation, but it’s fantastic! When using the UltraZoom program, the two microphones on the processor work together to hear voices from straight ahead, while sounds from the side are attenuated. Like anything when used properly, it is very convenient for me. The myPilot (and the ComPilot) can control the processor. One useful function on the remote that is not available on the processor is the ability to rapidly return to the original program and volume settings. I like to change programs with the remote because there is less chance of error. Let me explain: the processor has one button to change programs, one to increase the volume, and one to decrease the volume. Sometimes you may press the wrong button. If you’re on the phone and press the program button by mistake, (my UltraZoom program is in P2) you do not hear the phone. This is a bit annoying! You hear the same beeps when you change volume or program from the my Pilot as when you change them on the processor. The ComPilot is a real gem – it has become essential to me. This is real magic! It is quite stunning to use a phone with Bluetooth function with the ComPilot! You must pair the phone with the ComPilot. 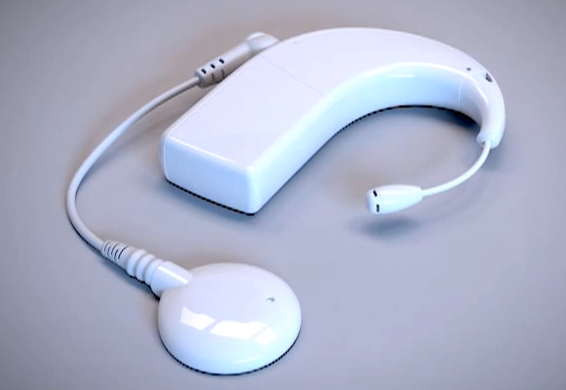 You can call and talk without holding the phone, and without anything extra on your ear. This is great! The sound quality is very good. When you want to make a call or answer the phone, simply press the button. The ComPilot has a microphone on the side so that the other party can hear you, even if the phone is in your pocket or bag. My sister (who also has a Naída), made a call with the cell phone up to 10 meters away. She could easily talk to someone without the phone in her hand. The ComPilot offers a range of options with the phone, such as last number redial, voice-activated dialing, call waiting and call forwarding. These options can be programmed by your audiologist. You can listen to music from a phone or MP3 player with high fidelity. It is truly amazing! The sound is so good. I also noticed that the listening quality is better if it passes through the ComPilot. I also listened to the sounds of nature on the computer – it is so beautiful and precise. I do not need subtitles when I use the TV receiver with ComPilot. I understand the voice and music ….. This is sensational! Most electronic sources that have the Bluetooth functionality can be paired with the ComPilot. Television, computer, MP3, iPod, phone, portable DVD player, etc – there are lots of choices. The ComPilot can control the volume of the processor. If you want to change the volume on a music player or other source, it is necessary to adjust the device itself. Moreover, if I listen to music with the ComPilot connected to a computer, I still hear ambient noise (50/50). If I get a phone, like most electronic devices that have a pause mode, the music stops and I answer the phone without having to touch anything on the ComPilot. The same goes for the TV; just mute the TV and you can answer the phone or talk to a person. The ComPilot also has a 3.5mm stereo jack for audio input so there are many ways to connect devices to it. You can even use an FM receiver with the ComPilot. My sister uses a Williams Sound model R35 with the ComPilot twice a week for meetings in a large room. She wouldn’t be able to attend the meeting without this system. The sound quality is better and more natural even though the audio is played through two accessories. It is really fantastic to have so many options. The choice is ours. One advantage that we have over hearing people is that we have nothing in the ear when listening to an MP3 player or an iPod. 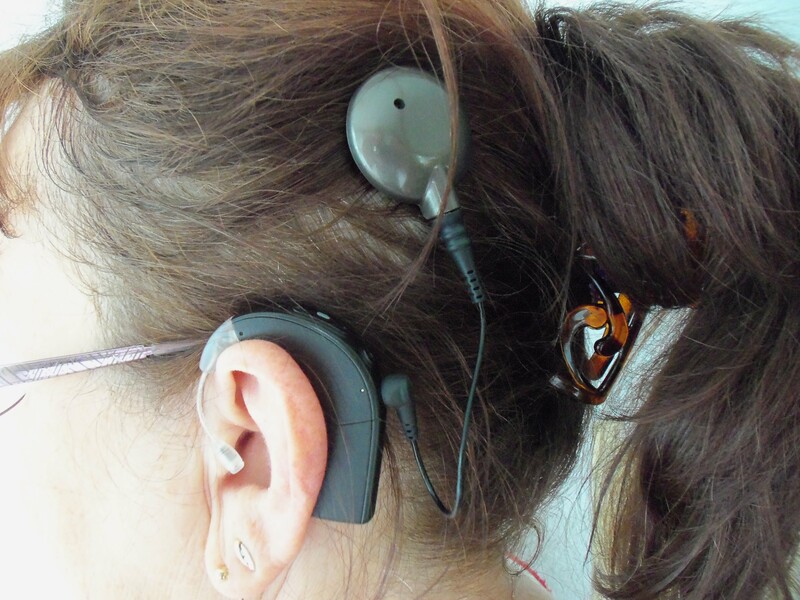 We can even choose to use Bluetooth devices without headphones or anything in our ear. On an airplane, I think it is possible that some carriers may not provide compatible audio inputs. For my part, I checked with headphones I had been given to use during a trip, and I think it should work. In any case I hope so! Moreover, according to the small guide that was given to me (page 33, French version), there is a warning not to use the myPilot or ComPilot when it is forbidden to use wireless electronic devices. Considering all these possibilities, the ComPilot is essential to us! It gives us all sorts of options. I feel overwhelmed. All this together with the implant gives me the pleasure of hearing. It is a gift from heaven! The Naída has a sound to indicate the program number. Program 1 (beep) Program 2 (beep beep) and so on up to the 5th program. For the volume, the tone of beep goes up when you increase the volume, and it goes down when you decrease the volume. When you reach the nominal volume, two beeps sound. As I mentioned earlier, you can control the volume with the ComPilot, and you hear the same beeps. When there is only about an hour of battery life left, you hear a beep every fifteen minutes to remind you to change the battery before it is completely discharged. This is super! With this new concept, it is easier to maintain peace of mind and no longer worry that the processor will turn off unexpectedly. It seems like the time it takes to change programs is similar to the Harmony. This is something we could try to improve because in certain situations, I find that the program change is long, especially if you have to act quickly. This new program is really useful in conversations with a group of people. The ambient sounds are reduced, which allows you to better hear the person you are facing. You do not have to strain to hear through the noise. It’s less tiring, more relaxing. I find that in some situations, I am even more comfortable than people with normal hearing! Some people have remarked about this to me …. It’s nice to know that we are envied in certain situations. I also like to use this program with the TV when I don’t have an audio connection. And in an automobile, UltraZoom is also useful for understanding if you are sitting in the back seat, and you want to hear somebody sitting in the front seat. This is going to be a very popular program. Sleep mode is also an ingenius idea. This function is useful when you want to turn off the sound without removing your processor. It gives you more peace of mind if you want to sleep or rest. It provides a better focus for reading or intellectual work. Just press the program button for about 4 seconds and the processor goes to sleep. To return to normal operation, simply press and release the program button again. If you remove your processor for more than 5 minutes with the battery in place, it falls into sleep mode automatically. This saves the battery. Before you replace the processor, slide the battery off and then back on, and everything returns to normal. 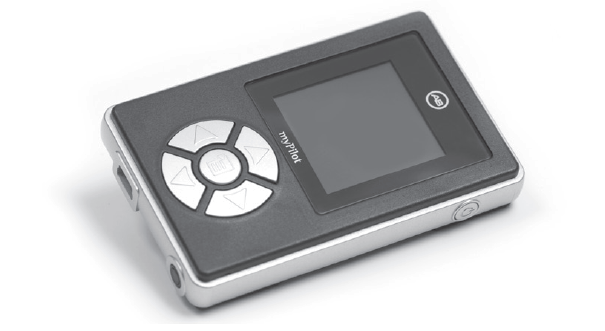 The audiologist can store up to five different programs on the processor, which can be changed by using the AB myPilot remote control or pushing a button on the Naída CI processor. One push of the button and the processor switches to the next program. If the processor is in Program 5 when you push the button, it cycles back to Program 1. The processor holds five programs per ear. For a bilateral user, the programs and the order of the programs should be the same in both processors. If both processors are initialized by the audiologist as a bilateral processor, then maps for both ears are stored on the processors. The processor identifies the ear when the headpiece is put on and loads the correct map. Personally, I do not change processors between ears, because the headpieces are attached to the cables in a way that is optimal for me, but if they were switched, they would still work fine. The volume can be changed in two ways. First, you can increase or decrease the volume with the toggle-push button on the Naída CI. Again, with QuickSync, changing the volume on one ear will also change it on the other ear at the same time. The second way to change the volume is with the AB myPilot remote control, which has buttons and a graphical display. QuickSync is an important feature for me, because it makes life easier. You don’t need to change and check the programs or volume on both ears. Rather, you push the button on one processor to change the program or the volume, and the other ear is automatically changed at the same time. I use the telephone either with the ComPilot or with the DuoPhone feature. If you are a bilateral recipient using DuoPhone, you put the telephone to the ear and the signal is not only presented to that ear, but it is also streamed to the other ear, so you hear it in both ears simultaneously. With ComPilot and DuoPhone, telephone use is better than ever. DuoPhone decreases the microphone sensitivity (opposite ear). I always hear better when I hear signals in both ears. DuoPhone provides signals to both ears, making the telephone much easier to use. With ComPilot the sound is streamed to both processors. You can connect the telephone to the ComPilot either with Bluetooth or with a standard audio jack. Afterwards, the audio signals are streamed to both ears. This streaming can also be used for listening to music. If you have stereo music, the left channel is streamed to the left processor and the right to the right processor, which sounds fantastic! UltraZoom is a speech-in-noise program, which greatly improves speech intelligibility in noisy situations. UltraZoom uses two BTE microphones and calculates a beamformer with both microphone signals, which “zooms” to a talker in front of you, while noise from the back and the sides is attenuated. This program works great, if the person you are talking to is in front of you. I especially like UltraZoom when I go for lunch in the noisy canteen, or when I go out to a pub with friends. I always switch to the UltraZoom program and understand speech much better in loud environments. This program works the same for unilateral as well as bilateral users. According to me, the latent time between the programs is similar to Harmony. This is something we could try to improve because in certain situations, I find that the program change is long, especially if you have to act fast. I especially like the UltraZoom program for its effectiveness. I also like the little beeps to indicate the number of programs and especially the battery drain. This prevents embarrassing situations. In conclusion, the whole processor is complete; what else can you ask for? I think it is almost perfect. 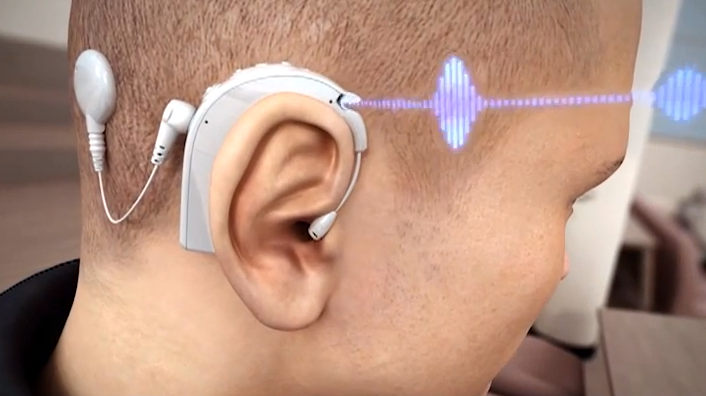 This is a big step for the future of the hard of hearing. We can regain confidence, take on new projects, and have new dreams. Here is the complete guide to the new Naída Cl Q70 processor and its accessories, in several languages. I am 58 years old. I have been married for twenty-five years and am the mother of three beautiful boys that I adore. They helped me get through all these trials. They were my reason to act and agree to receive the implant because I was afraid! In 1973, I completed my studies with difficulty. I began to feel that I was losing my hearing. Then I found a job in 1974. 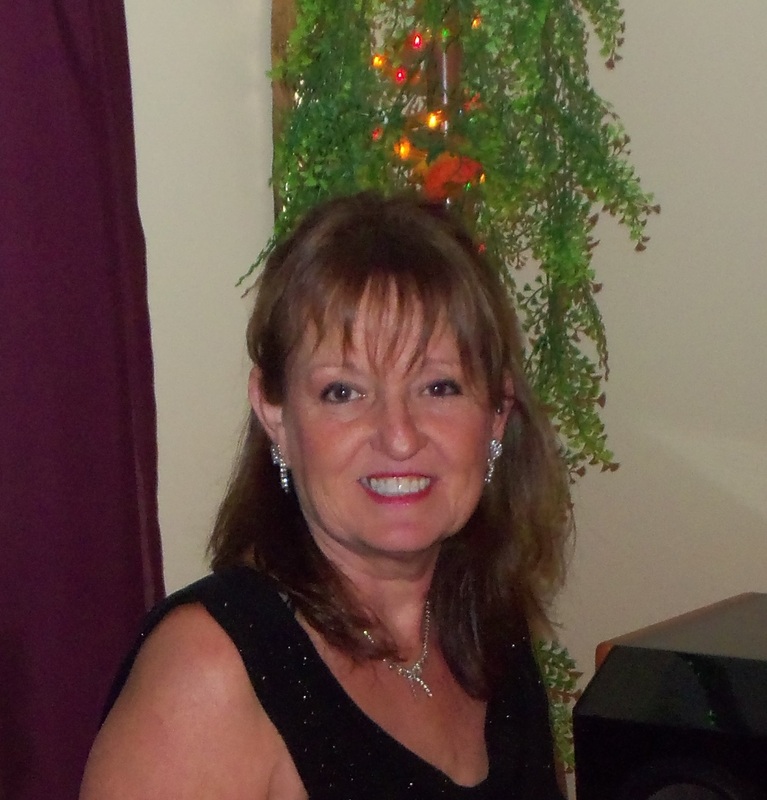 As I was a secretary-receptionist, it was very difficult for me so I got a hearing aid. It helped me for sixteen years to complete my tasks, but not without difficulty. My position was eliminated when I left the job. My hearing continued to decline. I didn’t feel capable of continuing my career. I started to isolate myself as I progressed into severe to profound deafness. It was desolation! A person who worked for the rehabilitation center told me about cochlear implants and informed me that I might be a good candidate. So I went through the process and received my gift from heaven in 2006 at the Hôtel-Dieu de Québec, Canada. I had very good results. I was so happy! For me it was the beginning of a new life. Of course the implant has improved my quality of family and social life. I am calmer and I listen to others more. I no longer pretend to have heard. I heard that! If I don’t catch something the first time, it does not bother me to ask to have it repeated, because it doesn’t happen very often. I’ve started to listen to music again, and can hear song lyrics. I listen to the sounds of nature, especially chirping birds and the call of the loon. It’s beautiful! Within a month, I’ll be grandmother and I will be able to hear the cries of my grandson. What barriers have fallen! I am now a fulfilled woman. What happiness! Stefan Fredelake studied audiology and hearing technology. He worked as a research engineer for Advanced Bionics GmbH in Hannover, Germany from April 2011. His research area is sound coding for cochlear implants. This entry was posted in Events and tagged Advanced Bionics, cochlear implant, Naída, Naida CI Q70, processor by CochlearImplantHELP. Bookmark the permalink.